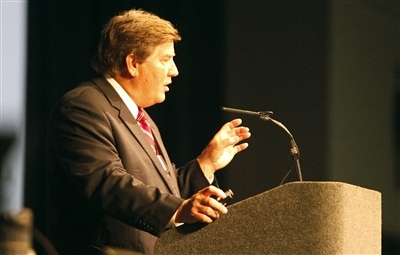 The 2011 Florida Annual Conference, which concluded June 4, had its moments of joy, sorrow and excited anticipation. 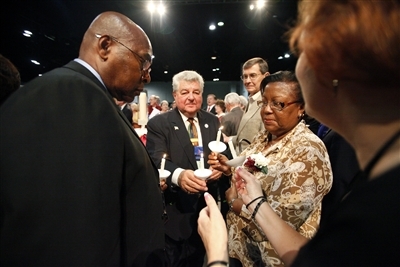 Meeting in the Tampa Convention Center, the site of next year’s United Methodist General Conference, clergy and lay members of the Annual Conference decided on delegations to the 2012 General and Southeastern Jurisdictional conferences. 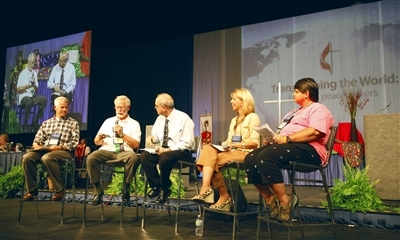 They celebrated covenant partnerships with Methodist churches in Cuba, East Angola and Haiti. And they gave their approval to a future direction for the Conference’s mission. Election of delegates to General and Jurisdictional conferences dominated the proceedings, with balloting interspersed throughout the three-day meeting. After an initial glitch, the electronic voting procedure proceeded smoothly, but there were several ballots on both the clergy and laity sides that stalemated, failing to produce an elected delegate due to insufficient votes. The delegations were not completed until almost noon on June 4, past the scheduled time for adjournment. The clergy and lay leaders of the delegation, respectively, will be the Rev. Jorge Acevedo, pastor of Grace United Methodist Church in Cape Coral, and Mickey Wilson, director of the Conference Finance and Administration department. Some members of the Conference noted that more delegates under the age of 40 were elected this year. The youngest clergy delegate, the Rev. Emily Oliver, gave birth to a baby just three days before the opening of the Conference. A complete list of the elected delegates can be seen here. On June 3, the Conference received reports about its covenant agreements with overseas partners. A story about the visit of Cuban Bishop Ricardo Pereira to the Annual Conference can be seen here. In his report on the statistical and financial state of the Conference, Wilson used humorous graphics to declare “It’s a jungle out there.” He recounted several economic hits taken by the State of Florida in 2010, including the BP oil spill, which impacted tourism. 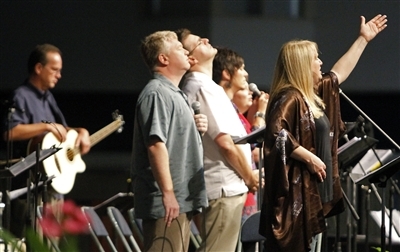 Wilson noted that Conference membership declined more than 3 percent to 294,479, and average worship attendance was down 4.8 percent, continuing a 10-year decline. However, he said, giving was up by $1.6 million, and Conference spending was about $500,000 less in 2010 than the previous year. Members of the Conference approved a budget for 2012 of $17.8 million, a 1.8 percent increase, but an amount, Wilson said, that is less than the Conference’s budget from four years ago. Members of the Conference also approved a proposal from the Board of Trustees to relinquish the bishop’s residence, returning it to Florida Southern College, which owns the property. The proposal authorized the board to borrow up to $250,000 to purchase a new residence for the next bishop before he or she takes office in September 2012. The Rev. Beth Fogle-Miller, director of Connectional Ministries, gave the members of the Conference a preliminary look at the work of the Strategic Leadership Team, a group chosen by Bishop Timothy Whitaker to articulate the Conference’s core purpose and to examine whether its ministries are in line with that purpose. An article about that report can be seen here. Members of the Conference endorsed the team’s direction. Because the Conference ran well behind schedule, consideration of several resolutions, some of which were potentially controversial, was not taken up until after noon on June 4. Before the resolutions could be considered, there was a motion from the floor to table all of them. The motion passed. The resolution also directed the bishop’s task team to educate clergy and key lay leaders about inclusivity, educate congregations about “open itinerancy” and review and evaluate Conference personnel policies. The Conference voted to discontinue six churches. One that received particular attention was First United Methodist of Tampa, whose members contested the discontinuation. South Central District Superintendent Sharon Austin gave a lengthy presentation about the reasons for recommending the church be discontinued. Austin said the district is committed to continuing a United Methodist ministry in downtown Tampa and that the property of First UMC would become “a legacy” that would enable a new ministry to be started there. In the debate that followed the motion, a member of the church expressed disappointment with the recommendation and asked for an extension of one year. However, the Conference voted by about a 3-to-1 margin to discontinue the church. Reflecting on his next-to-last Annual Conference, Whitaker said he was pleased with the way members had conducted business in spite of election pressures. “I thought there was a very good spirit manifested throughout the week, based on the mood during the plenary sessions and the comments from members. It’s always difficult when it’s an election year. Emotions run high and the process is tedious. It makes it a challenge to take seriously the business of the Conference while you’re in the middle of electing people,” he said.